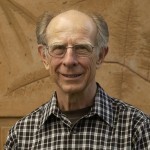 From memory, James Hansen wrote of the time-scale for complete deglaciation of the Greenland and Antarctic ice sheets as in the region of 3 to 6,000 years. With certainty it would take multiple millennia. In this post I’d like to paint with a broad brush in a way that is indicative rather than definitive. I don’t have time to chase down the latest piece of research at each point. These movements in temperature and sea were achieved with CO2 varying between about 180 and 300 ppm. 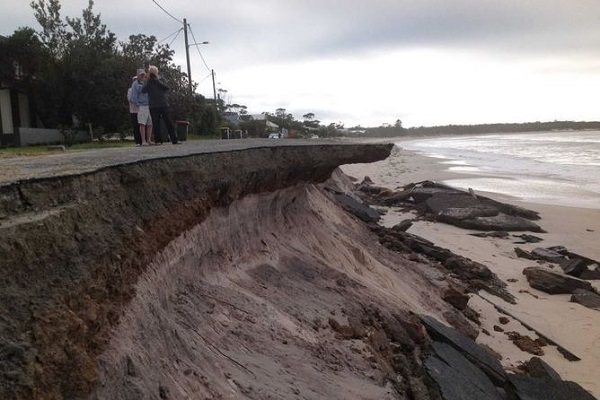 This effect is thought to be caused by the Milankovitch cycles, changes in the earth’s tilt and orbit, and began soon after the closure of the Panama Isthmus, which may have been a pre-condition. The Milankovitch cycles have been the basic driver of climate change for the last few million years until the industrial age. The rate of forcing is now many times larger, perhaps 25 to 30 times. Back in 2008 in my series of five articles, which now unfortunately reside in a 3-month hole in the Larvatus Prodeo record, I made five statements relating to CO2, temperature and equilibrium sea level, drawn from the research literature referenced to pre-industrial times. I’ve copied and modified these statements from this source, where, as luck would have it, a commenter copied some of my stuff without asking me. 5. 500 (400-600)ppm gives a temperature variance of 5 to 7°C and SLR of 75m (complete deglaciation). Each statement assumes that emissions will be held at nominated levels for thousands of years. The use of the 0.7 ending reflects the quantification of the term “now” for temperature in the literature. 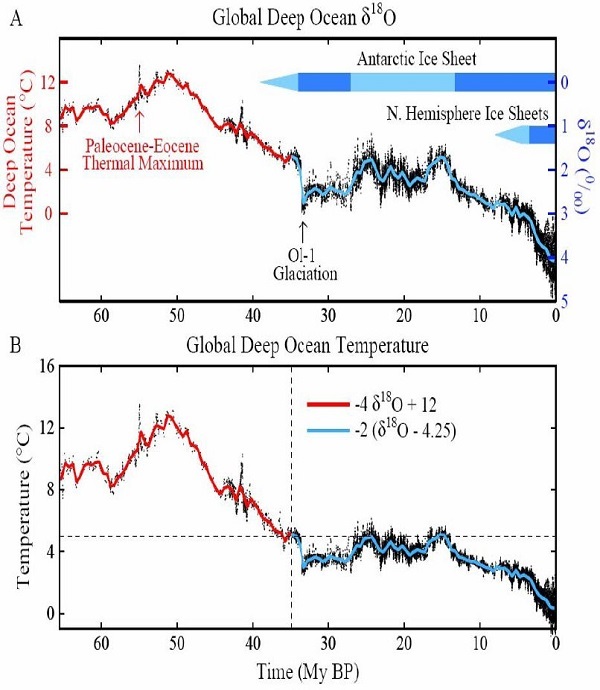 For example, the Eemian was said to be 1 to 2°C warmer than now. Statement 3 reflects the situation in the Eemian. I’ve replaced 4-6m with 5-10m to conform with IPCC5. Statement 4 reflects the Pliocene. Later research by Rohling et al narrowed the uncertainty range for SLR. In Statement 5 I’ve reverted to an earlier position held by Hansen. 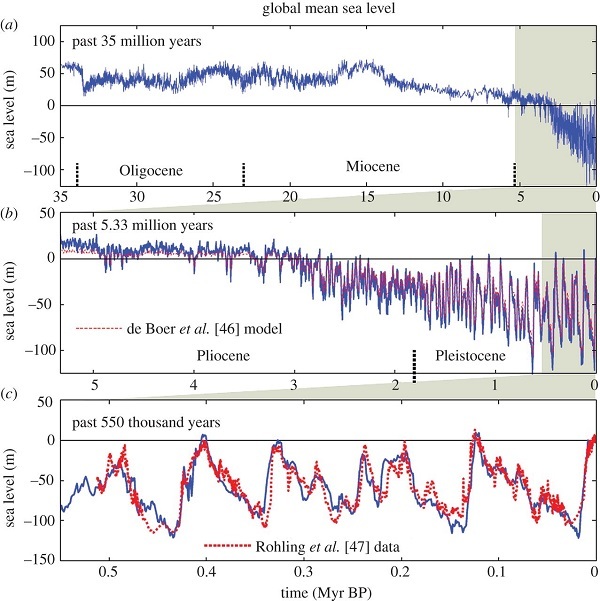 His 425ppm does not fit with later research by Aradhna Tripati et al, who found temperatures were ~3° to 6°C warmer and sea level was 25 to 40 meters higher than at present during the Middle Miocene. Elsewhere we are told she found CO2 to be 400-450ppm at the time. 425-450 ppm CO2 does not necessarily guarantee an ice free world. It will almost certainly wipe out the Greenland Ice Sheet (GIS) and West Antarctica Ice Sheet (WAIS) at some future point (I’d bet sooner rather than later – anywhere between a few decades to a few centuries and we are likely to be committed to this already at 385 ppm). But not necessarily the East Antarctic Ice Sheet (EAIS), or at least not all of it. 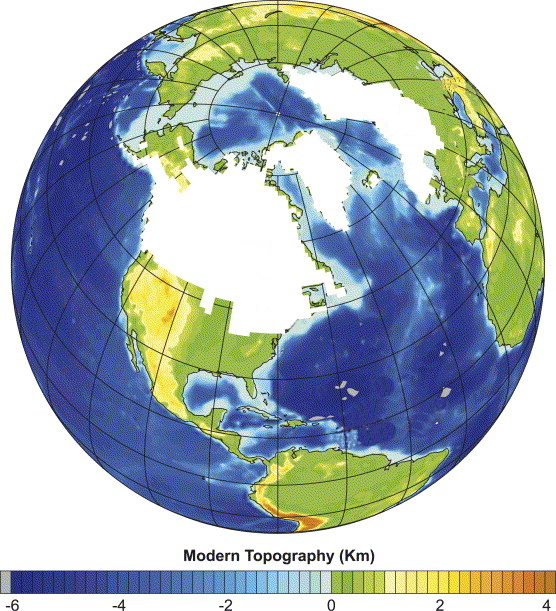 I think the Holocene floats in a 2°C temperature band where there is relatively little ice sheet activity. We appear to be at the upper limit of that band. The image was downloaded by me in 2009. I think “present” is likely to be 2.9mm pa. 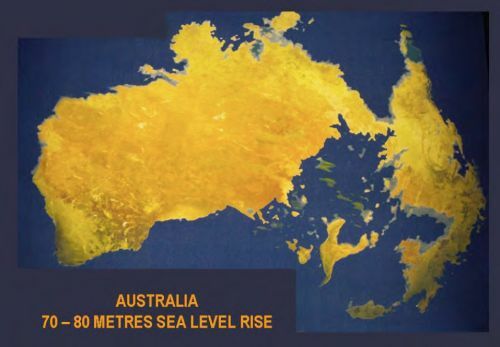 The main message, though, is that current sea level rise is predominantly driven by the thermal expansion of the oceans. Yet the contribution of thermal expansion to SLR with complete deglaciation will be minor, I think in the order of several metres. The main game will be ice sheet decay. 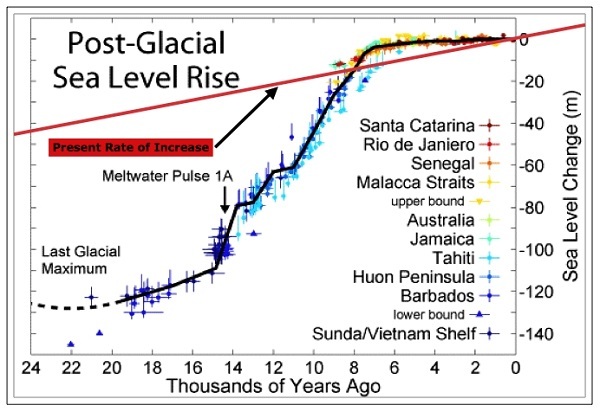 We know that coming out of the Last Glacial Maximum SLR was very rapid at times. 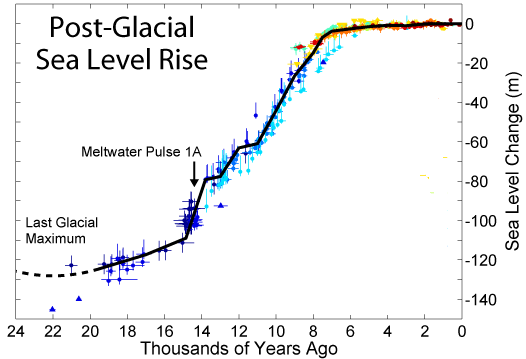 About 14,000 years ago Meltwater pulse 1A yielded SLR of about 20m in less than 500 years, perhaps just 200 years. The question really is, when will ice sheet decay seriously take off? We don’t know, but as I mentioned here, Richard Alley and co have run their models and found a possible five metres in the next 200 years. 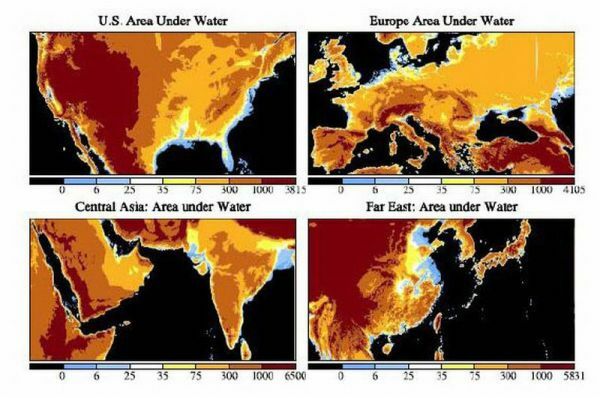 You can check out the vulnerability of various parts of the world with the Firetree flood maps. I’ll finish with a few images. 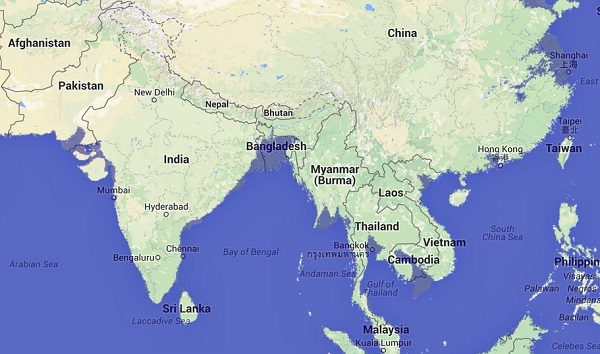 Each red dot is a city with a million or more people. 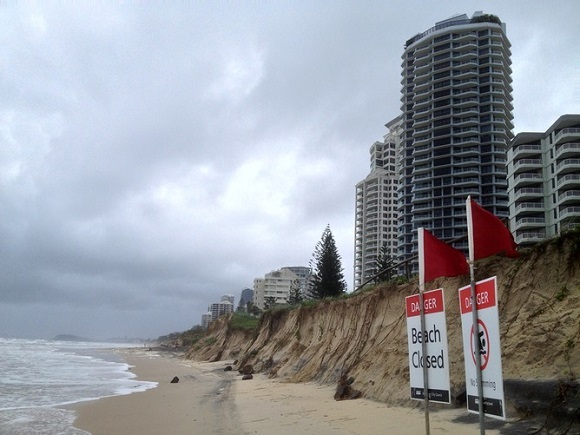 See also: Ice sheet decay spells danger from sea level rise for how sea level rise may progress in the next century or three. 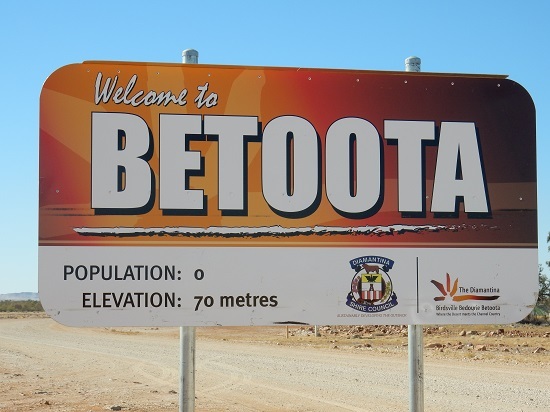 Previous PostClimate clippings 145Next PostIndigenous constitutional recognition – will we get more than symbolism? 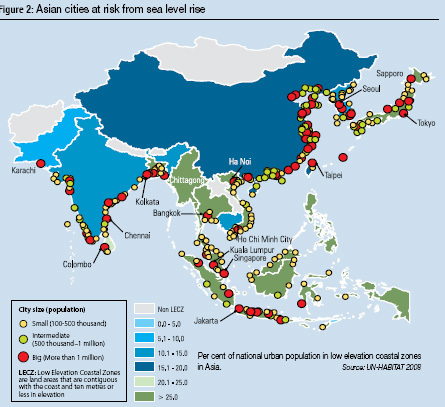 An impressive set of data Brian that goes well beyond sea level. Should be added to Key Posts? Probably, John. I would have liked to spend more time researching the area. 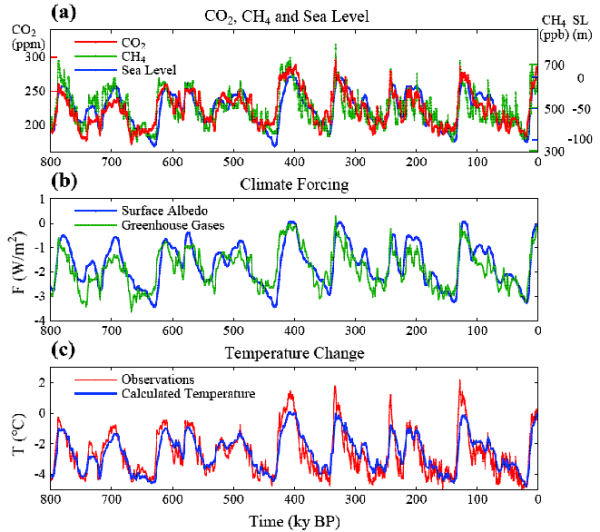 The data presented has implications for climate sensitivity. 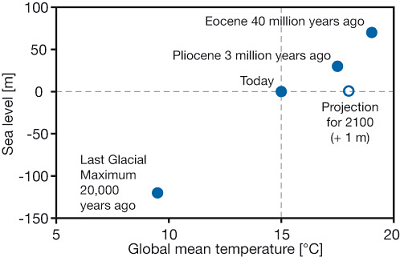 The increase in temperature from the Last Glacial Maximum to the Holocene was achieved with less than doubling CO2 from 180 to 280ppm. Thanks a lot for that wealth of graphs. Wow!